The “I Eat Burgers” event was organised by friedchillies.com to celebrate the love for BURGERS. 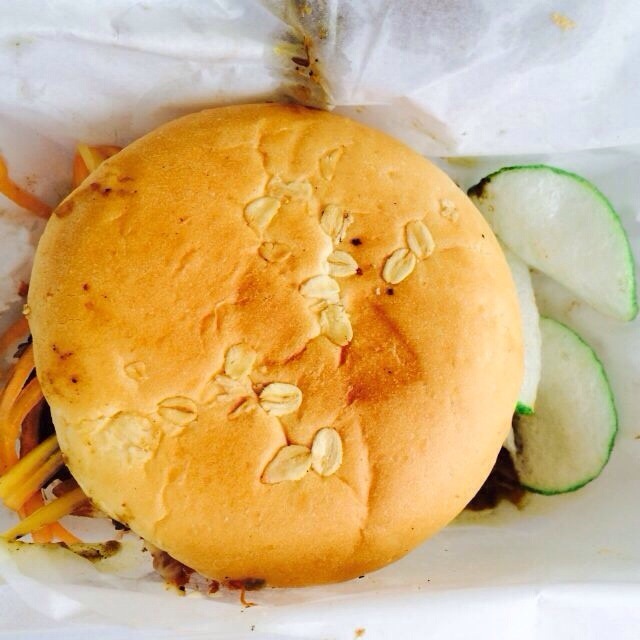 It was a one day event, June 7th 2014 from 11am to 11pm held at Padang Timur, Petaling Jaya where it gathers the top 20 burger vendors in Klang Valley to showcase their creations all in one location. Amazing idea. No burger lovers would miss it. They were selling their “Say Cheese” burger and “Swisstake” burger which we ordered one of each. We absolutely love one of it. 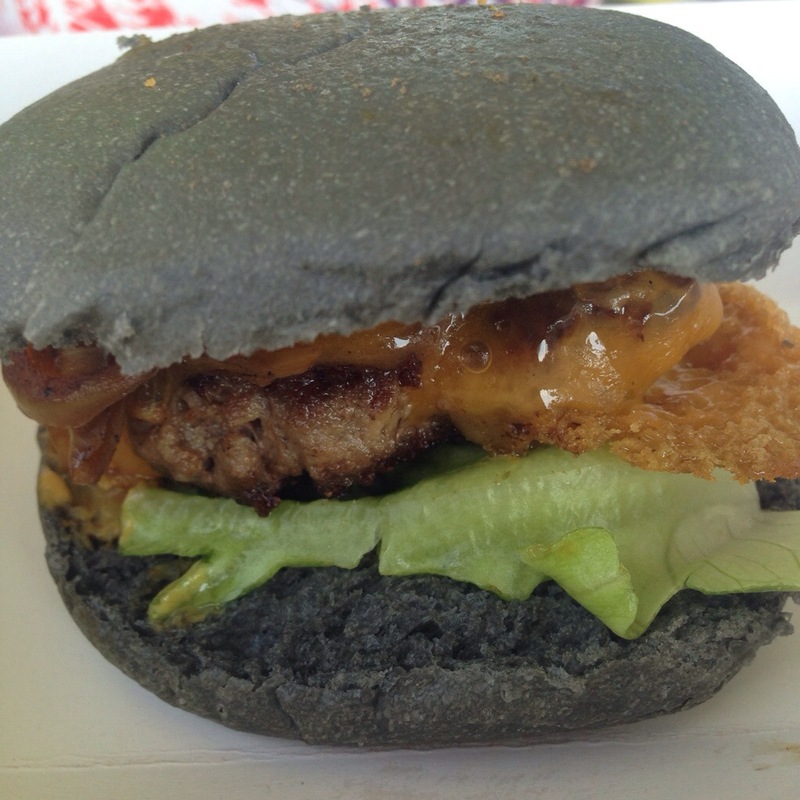 myBurgerLab is famous for their black burger buns. To be honest, it tasted just like your normal burger bun. The “Say Cheese” burger was our favourite. The cheddar cheese that looked like it was fried, mustard that was grilled, caramalised onions and their secret x-sauce was the perfect complimentary to a nicely cooked beef patty. The cheese added a nice crunchy texture to the burger and the sauce was delicious. “Swisstake” was not as impressive as the “Say Cheese” burger. The sauteed shiitake mushrooms lost its usual strong flavour and just tasted like button mushrooms and the cheese didn’t do much either. However, the chicken breast was deliciously grilled – was not dry at all. They ran out of all of their burgers but one when we were there and that was around 3pm. The queue was continuously long so we had to have a go at the only burger they were selling which was the chicken sandwich. To be honest, it was nothing special. 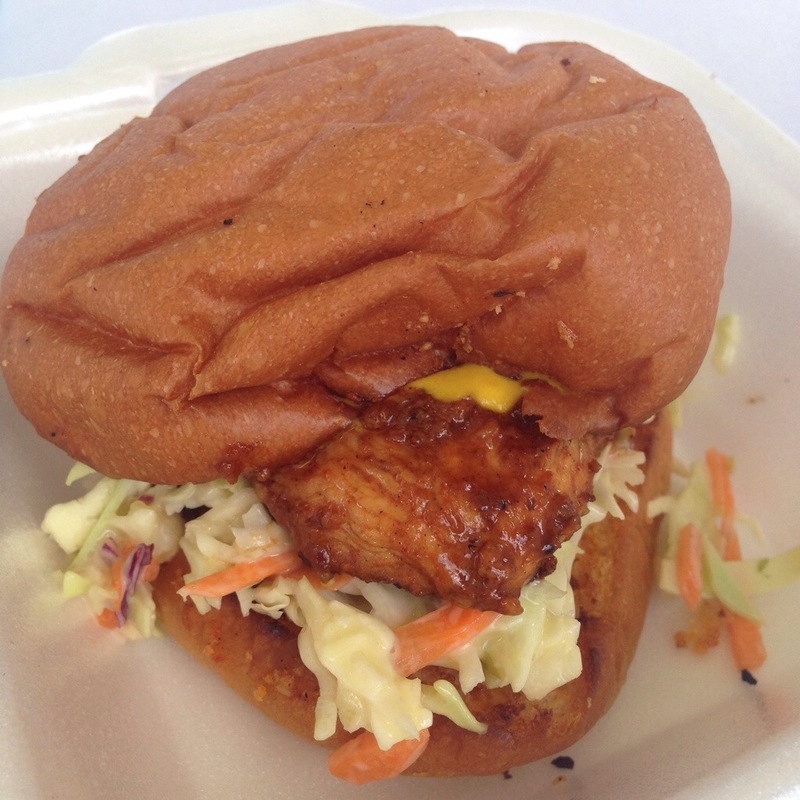 The chicken breast was coated in teriyaki sauce and instead of putting lettuce and cucumber with the burger, they dressed it with homemade coleslaw which was nice. The bun was soft and nicely toasted. It wasn’t bad but it was not amazing either. I guess if they had more options, others could’ve been better. Would have to go to the restaurant to give other burgers a try. The menu that they had on that day was very eye catching with the unusual dressing to the burgers and the name of the burgers. First we tried the “Saloma Burger” which was chicken breast with lettuce, onion, spicy percik sauce, grated papaya, cabbage and onion mayonnaise. Lets be honest, if you see that in a menu, you will be intrigued to taste it. But it was actually too weird to be good. The combination of all that taste and textures were too much that it made us feel nauseated after a few bites. The spicy percik sauce tasted more like an off rendang sauce and grated papaya did not go well with everything else in between that burger bun. On top of that, the chicken breast was not fully cooked. Some bits was still pink! So it was just a bad one from them. 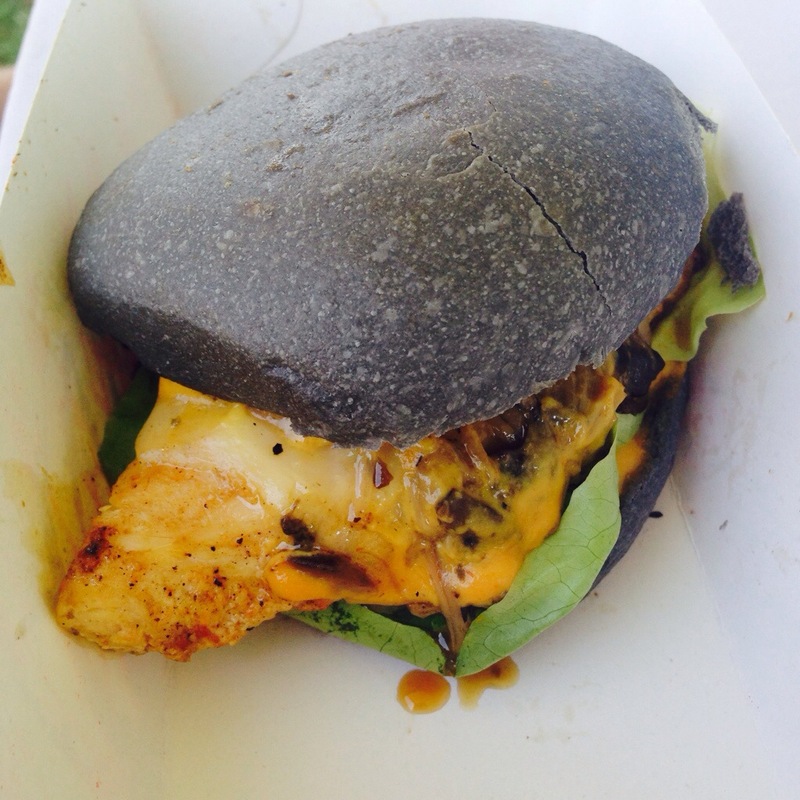 On a different note, the second burger we tried from them was the “Ms Ayumi” burger which was grilled chicken breast with lettuce, onion, teriyaki sauce, grated cucumber, sesame mayonnaise and seaweed. These different taste actually complimented each other. The seaweed was the star of the dish. It added a little something to it. The chicken breast was coated in this delicious teriyaki sauce but again, it was not fully cook! Lets hope I don’t end up with food poisoning tomorrow from this. But overall, I enjoyed it until I forgot to snap a picture of it. THE BEST BURGER OF THE DAY goes to “Dear Lover Burger”. 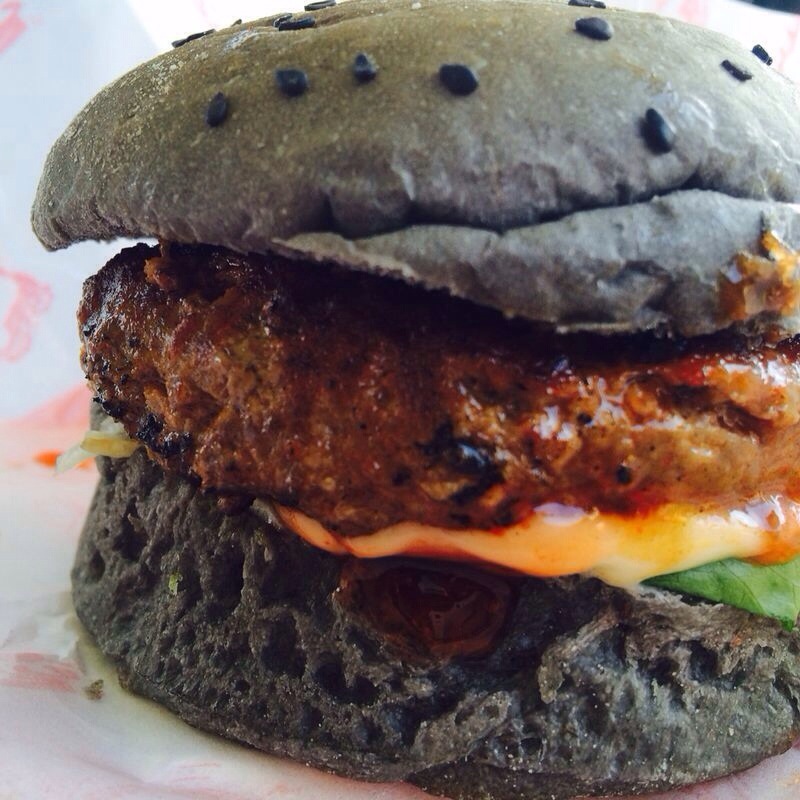 A charcoal bun with beef patty coated in their marinade and grilled to perfection, lettuce, mayonnaise and chilli sauce. Simply amazing when you just go back to basic. No special twist, other than the charcoal buns which is just to be instagrammable I guess. This was the last burger we had and we left with a full stomach and a smile on our faces.